These video poker terms are words and phrases you might hear in the video poker area or read about online while trying to learn how to play video poker. Study this video poker glossary, and you’ll be learning much of the gambling slang used by video poker players. It should help you determine the rules of the game, too. The amount of money bet. The total action on a session of video poker is the total amount of all bets you made. A row of video poker machines (or slot machines). How much money you have to wager. Your bankroll is the amount of money you’re willing to spend in any given gambling session, somewhat like disposable income is to a monthly budget. Hopefully, your bankroll is not synonymous with your bank account. The button you push to make the maximum bet in video poker. The “bet max” button is important because many video poker jackpots only pay out the maximum amount if you wager the maximum number of coins. The version of Jacks or Better video poker which pays out more for certain Four of a Kind hands. Standard Bonus Poker pays out more for four Aces, 2s, 3s, or 4s. The same as a bank of Vp machines, though it might refer to several banks of them. The term carousel usually has the connotation that the bank of machines is linked to one progressive jackpot prize. Carousel can also refer to slot machine banks. Money is given to a player for joining a casino’s slots club or Vp club. When you wager a certain amount, you’re given a rebate. Notice the difference between cash back and comps (see comps below). The casino attendant who refills the video poker machines or slots with money, but who also makes change for customers. The amount of money you place in wagers during a session on one machine, used by the casino to determine how much cash back you receive. Club members get a slots card or Vp card they scan through the machine before playing, so you need to remember to scan, or you won’t get maximum cash back. Credits are the currency of the casino. You convert cash into credits, then turn those credits into cash before you leave the casino again. How many hands it takes (on average) to win a video poker jackpot on a given machine. The cycle tends to be around forty thousand spins of the machines. Most of the time, the royal flush (or natural royal flush in wild games) is the jackpot hand in video poker. Please understand that there is no cycle per se–you could win a jackpot on the first spin, or it might take four-hundred thousand spins. A random number generator is used to determine the hand, not a 40,000-number cycle of combinations. Video poker machines in which the 2s are wild. These machines don’t pay back on Jacks or Better, but instead of 3 of a Kind. The jackpot is a natural royal flush–that is, without wild cards. Either in poker or video poker, a hand of cards which requires a specific card to improve it. The average payout percentage on either a slot machine or a video poker machine over a long term. The expected return can be calculated by multiplying the house edge times the average amount wagered per hour. While most games in the casino have negative returns, some video poker machines offer a positive return. The deviation on any given hour is great, so this doesn’t determine what you’ll win or lose in a short span of time (or real close to it). A computer can be used to determine the perfect playing strategy for any card game. If you can execute this strategy in the real world, then this would be called “expert play”. Among poker cards, either the King, Queen, or Jack. These are the cards that have a figure (and their face) on them. One-eyed Jacks are the Jack of Hearts and Jack of Spades, which are shown in profile. Together with the King of Diamonds, these are the One-eyed Royals. Among the various iterations of a video poker machine, the one which pays out the most. It’s best to learn what the full pay version of each Vp game is. It’s also helpful to know that “full pay” and “positive expectation” are not the same. 9/6 Jacks or Better is considered the full pay Jacks or Better game because it’s the best payout structure you’ll find, but it still has a slight negative expectation. The now mostly defunct little basket or container under the video poker machine which catches coins when you win. Slot machines have a similar hopper, and this is what makes the distinctive clinking noise when you win, alerting all around you that you’re the big winner. The mathematical advantage a casino has on a particular game. The house edge will be given as a percentage. For most legitimate games, the house edge fluctuates between 0.5% and 7%, which means it’s the amount of money you expect to lose on any given wager. Most video poker games should have a house edge of less than 3%–some versions significantly less. When you need one card to hit a straight (5-card sequence), but that number is sandwiched between two other cards in the sequence. If you had, 6-7-9-10, you would need an 8 to fill an inside straight. Players would rather have an outside straight (below) because it gives them two numbers which might hit. The inside straight was often called a “gut shot straight” by Norman Chad. A video poker variant which adds one Joker to the deck, which is wild. Deuces Wild has four wild cards, but Joker Poker only has one. The same as Joker Poker. In Texas Hold’em and other versions of table poker, a kicker is a high card that you hold onto so you can break a potential tie. In video poker, this is a bad idea, since ties don’t happen and you are only forming hands against a pay table. Never keep kickers in your video poker hand. A royal flush is built using the traditional ace, three face cards, and the ten card all of the same suit. This determination is used for games of video poker where a wildcard rule is in effect. A royal flush using a wildcard is a Wild Royal Flush, and this hand pays less than the Natural Royal Flush. A 5-card sequence which can be filled when you hit a card on either end of the sequence. In the earlier example of the 6-7-9-10, an inside straight with many of the same numbers would be 6-7-8-9. In this example, you could fill the straight with either a “5” or a “10”, doubling your odds of hitting the straight (in comparison to an inside straight). A hand which cannot be improved. This is going to be true of hands like four of a kind and full house. Called so because you “stand pat” instead of asking for more cards. The amount of cash a video poker machine pays back over the long term. If you have a 99% payback, you’ll get $99 for every $100 you wager. If you have a 95% payback, you’ll receive $95 for every $100 you bet. If you have a 101% payback, you’ll get $101 for every $100 you place on the line. The amount of cash awarded for filling a poker hand. In progressive jackpots, these can be huge, while payoffs can be small on all video poker machines. A Jacks or Better payoff for a pair of jacks is 1-to-1, meaning you gained nothing or lost nothing on that hand. A pair of Queens at least gives you 2-to-1. Progressive jackpots continuously grow in size, until someone in the network hits the progressive jackpot and it resets. These progressive jackpot networks can contain dozens, maybe hundreds, of video poker machines, so the jackpot is rising every second. The same concept applies to slot machines. Video poker progressive jackpots draw in gamblers since the prize money might grow to astronomical sizes. They can rise high enough that you would have a positive expectation for the amount you’re wagering, though your odds of hitting the jackpot would still be the same (not good). You neither win nor lose, so a push is a tie. Most slot machines and video poker machines have a hand which pays out 1-to-1, so you get a push. These often have the same sounds and flashing lights as a real win. The number value on a poker card. The cards you discard to get a new hand. These cards cannot come up again in the same hand. This abbreviation stands for “random number generator”, the mechanism which makes modern video poker possible. 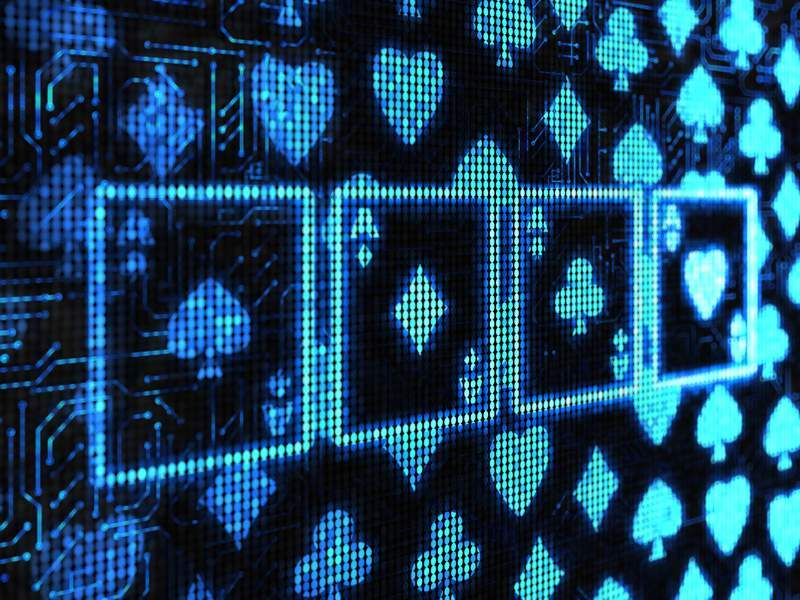 An RNG is a computer chip used to determine outcomes on every single spin of a slot machine or video poker machine. In the case of video poker machines, the RNG simulates all the possibilities in a deck of cards (in the right proportions). Like slot machines, Vp myths tend to focus on figuring out the pattern of the RNG, but this misunderstands how the technology works. A term for a video poker machine that doesn’t pay out the “full pay” table. A short pay video poker machine isn’t going to be the best version of the game. This is a rewards program for slots players and video poker players who bet on a lot of spins. The package includes rebates (“cash back”) and comps for certain levels of activity. Slots cards are used to keep track of play. The deviation you can expect from long-term payouts on a Vp machine. You hear about expectation, but just about any session of video poker is going to deviate from that expected return. Players can figure how much deviation, which is tied to how difficult it is to hit the jackpot. The harder a jackpot is to attain, the more significant the deviation is going to be. Progressive jackpots naturally have the most significant deviation and therefore the most volatility, as you get long droughts where you don’t win, but huge payouts when someone hits the jackpot. A card which substitutes for any other card in poker. If you have deuces wild, then any “2” you receive can be replaced for any other card in the deck. Jokers are often wild, though this requires either 1 or 2 extra cards being put in the deck. In video poker, Deuces Wild is a favourite game, while Jokers Wild (with 1 Joker) is also common. You also have the Anything’s Wild video poker machine, where you can choose any one card to be wild. In games like Deuces Wild, Joker Poker (Jokers Wild), and Anything’s Wild, a royal flush formed using one or more wild cards. These pay out quite well, but usually not as well as the natural royal flush.